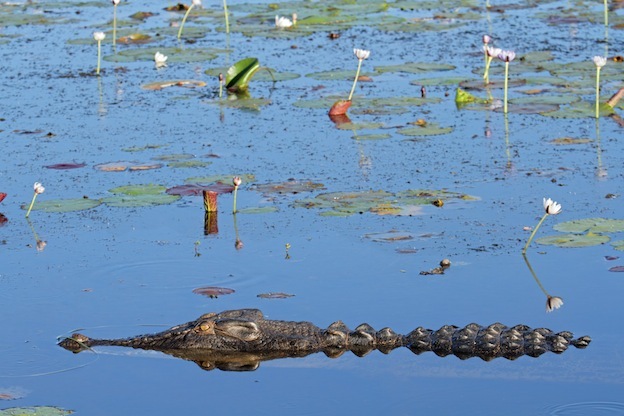 There are quite a few places out there where crocodiles live in the wild. They thrive in areas that are extremely warm due to the way in which their bodies regulate temperature. This includes Africa, Australia, Asia, and parts of the United States. They will enter water to cool down and they also drink it as well. They can go for long periods of time without water to consume. When they can’t find water they will roll around in the sand or the mud to help cool their bodies. They can live in a variety of different types of water out there. This includes lakes, lagoons, rivers, wetlands where there is lots of humidity, and even very small pools of water that occur during the rainy season in some locations. What is interesting is that crocodiles are able to live in salt water as well. Other reptiles including alligators aren’t able to do so. The reason or this is that the crocodile has salt glands in the mouth. This allows them to get the nutrients from the water and to absorb the salt found in it. There doesn’t seem to be a preference for them over freshwater or salt water. As long as their basic needs are met they are going to remain in a given area. In captivity, freshwater is used for their care. It is less expensive to clean and to maintain. While they are solitary animals, it isn’t uncommon for them to be found sharing the same area of water. They have their own proximity around it though and may come into contact with each other more often than they like. There is lots of aggressive behavior displayed from both sexes. When food is hard to find or they are ready to mate it will intensify. Is a huge problem when crocodiles are removed from certain areas though instead of destroyed. Even though all of their basic needs may be met in that new location it has to do with what is familiar to them. Most experts believe it also has something to do with the breeding process. They want to be able to mate where they are familiar and females want to have the same location to lay eggs in as they did before. 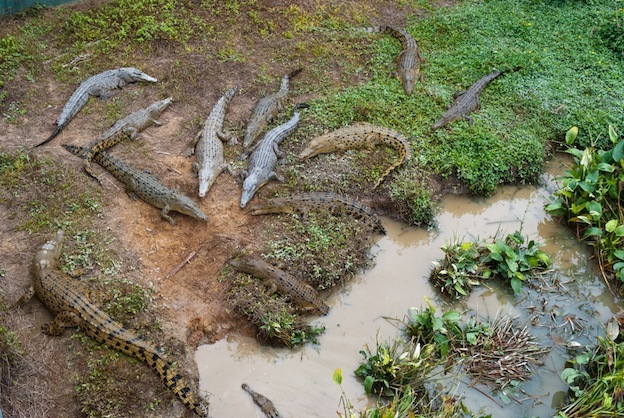 Humans continue to infringe on the habitat for crocodiles in many area. The concept of the two of them being able to live in harmony isn’t reality. Ironically, it is the humans responsible for such greed. They continue to build homes and recreational activities in these locations. However, when a crocodile shows up on the doorstep of a home in Florida it is all over the news. The headlines aren’t about the humans being in their habitat either. Instead, it is about how unsafe it is for people living in that area. Even with some forms of conservation in place these animals are losing their natural habitat at an alarming rate. While they do adapt well in captivity that doesn’t justify what they lose in the wild. You will find numerous crocodile farms out there where trainers perform a variety of tricks with them. Sometimes this includes placing their hand into the mouths of these aggressive animals. Sometimes things don’t go as planned with it either. There are lots of stories about these trainers being bitten and even killed during such events.